A chance Christmas encounter got me thinking about what being a virtual agency really means. I was at a soiree combining a thing I hate – making small talk – with a thing I love – free drinks. Having been abandoned by my other half and instructed to mingle, I was left facing a new acquaintance and attempting to explain what I did and what a virtual agency was. You know the kind of thing. Agile, adaptive, fast, flexible, cost-effective…. However, the gent I was talking to was kind enough to sum it up for me. “You mean you can’t afford an office” He pointed out smugly. Resisting my initial desire to intimately introduce him to the canape in my hand, I thought about what he had said. We can’t afford an office. Not if we want to keep on delivering for our clients. Not if we want to be creative, agile, flexible, cost effective and all the things our clients seem to love. We can only be all those things because we’re not limited by our location and we’re not weighed down with unnecessary overheads – like that office. Our strategists, researchers, animators, film crews, designers and developers are dotted around the world. They took a lot of finding – and it’s only because we’re virtual that we can make the most of their sublime skills. Now we wouldn’t want to blow that by making them commute to the UK from India, South Africa, the USA and Spain. But it’s not just our people who are dotted around the world. Our clients are too. And when someone in the US wants to talk over a campaign at 10pm in the evening UK time being virtual means it’s easier to be there for them. So yes, Mr Smug Christmas Drinker, we can’t afford an office. Because we’d rather spend our money and effort on delivering exceptional work for our clients on time and on budget. And that, after all, is what any good agency should be doing. And, I suppose we do use all kinds of great apps and software to collaborate and communicate with our clients and our people. And, I like that more. 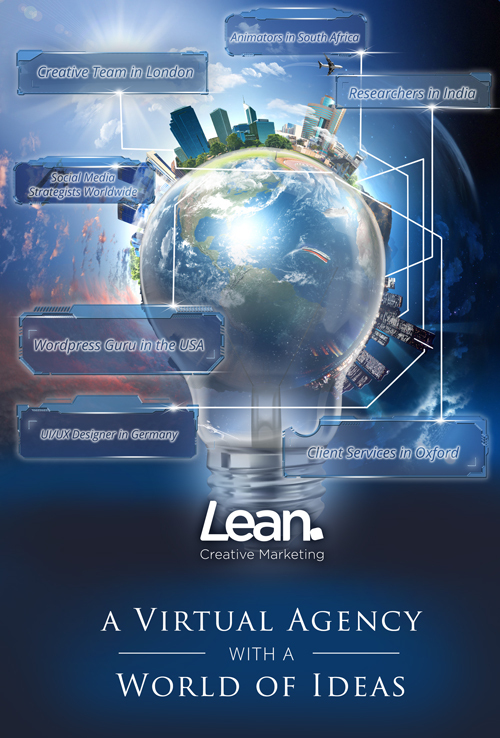 Because at Lean we have the essence and effect of a top-notch agency. But we don’t look, or act like one. We’re not precious. We’re not pricey. We’re not pretentious. We’re simply proud of – and good – at what we do.